EarthSky Tonight—Nov 4, Modest meteor shower tonight. Moon and Venus before dawn tomorrow. The radiant points for two November meteor showers – the South Taurids and North Taurids – both reside in front of the constellation Taurus the Bull. If you trace the paths of shower meteors backward, each shower appears to radiate from a certain point in the starry sky. As can be expected, the radiant point for the South Taurids is found in southern Taurus, while that of the North Taurids is found in northern Taurus. The South Taurids are expected to be at their best after midnight tonight, but you can start watching at mid-evening. And the other Taurid shower – the North Taurids – should be raining down the most meteors a week from now, on the night of November 11-12. As a rule, the Taurid showers do not exhibit strong peaks. The two Taurid showers tend to overlap and to plateau in activity during the first few weeks in November. On any given night, these rather slow-moving meteors produce the greatest numbers in the few hours after midnight, perhaps up to 10 meteors per hour. Although a modest shower, the Taurids can surprise you with a flamboyant fireball or two! Tomorrow morning, the waning crescent moon and the blazing planet Venus will rise over your eastern horizon shortly before sunrise. That is good news for meteor-watchers: it means a moon-free night tonight. What’s more, there will be moon-free nights all throughout the weekend. That is about as good as it gets for watching the Taurids. You do not need to find Taurus to watch the Taurid shower, for these meteors streak all over the sky. This evening, at 8 p.m. to 9 p.m., look for the bright ruddy star Aldebaran, the eye of the Bull, glaring at you in the eastern sky. Note that Aldebaran sits atop a V-shaped group of stars that outlines the Bull’s face. 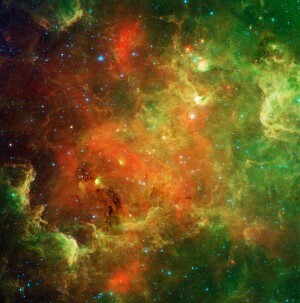 The star Elnath, Taurus’ second-brightest star, marks the tip of the Bull’s northern horn. Taurus the Bull climbs upward during the evening hours, and reaches its highest point in the southern sky after midnight. 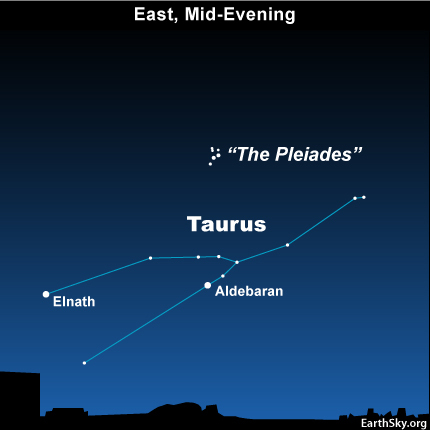 The higher Taurus appears in your sky, the more Taurid meteors that you are likely to see. After the South Taurids show their stuff tonight, the world’s eastern hemisphere (Europe, Africa, Asia, Australia and New Zealand) is more likely than the Americas to spot the moon and Venus low in the east at morning dawn! Site contents copyright © 2019 Recorder Online	except as noted. All rights reserved. | 88 queries in 2.080 seconds.